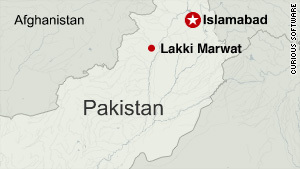 A terror attack in the Lakki Marwat district of Pakistan's North West Frontier Province killed 30 and wounded 52. (CNN) -- A suicide car bomb exploded Friday in the middle of a group of men playing volleyball in northwest Pakistan, killing 75 and wounding 60, district police officials told CNN. The attack was the second this week in Pakistan to inflict major civilian casualties following Monday's suicide bombing in Karachi targeting a Shiite procession which left at least 40 people dead. The terror attack happened in a residential neighborhood in the Lakki Marwat district of Pakistan's North West Frontier Province, police said. Some of the casualties were residents from houses around the volleyball court, district police Chief Mohammed Ayub Khan told CNN. Khan said eight houses in the neighborhood collapsed, and the blast was so powerful it could be felt from 11 miles (18 kilometers) away. He said he believes that more than 600 pounds of explosives (300 kilograms) were used. Volleyball is a popular sport in the area, and more than 200 people were watching the game when the bomb went off, the police chief said. District police officer Asmat Ullah said it exploded in the village of Shah Hassan Khel, which is about 10 miles south of the district capital, also called Lakki Marwat, he said. The area used to be a hub for militants before the military flushed them out about two months ago, the police chief said. Since then, militants have been making threats to the community, Mushtaq Marwatt, a member of a local peace committee, said on a local TV channel. Earlier Friday in the nearby district of North Waziristan, a suspected U.S. drone attack killed four people, a Pakistani intelligence official said. A guided missile was fired at a car carrying militants at 8:50 a.m. in the village of Naurak, about 9.3 miles east of Miran Shah, according to an official from the political administration and an intelligence official. One other person was hurt in the attack, the officials said. It was not immediately clear whether those killed and injured were militants, the officials said. Two of the dead were Pakistanis. The nationality of the other two could not be immediately confirmed. The largely autonomous tribal region of North Waziristan is near the rugged border with Afghanistan. The border area has been the scene of heavy fighting between Pakistani military forces and the Taliban, the Islamic militia that also is battling U.S. forces in Afghanistan. A third unrelated attack Friday also took place near Pakistan's border with Afghanistan. A remote-controlled explosive struck a car and killed five civilians, according to a representative from the Frontier Corps and a political administration official. It happened around 10 a.m. in the Salar Zar subdivision, in the Bajaur agency of the North West Frontier Province. Journalists Nasir Dawar and Nazar ul-Islam contributed to this report.